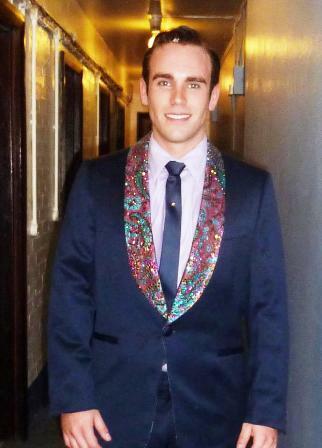 Michael Conway has just started his third year in the West End smash Jersey Boys as a swing and cover for Frankie Valli. I met up with the 26 years old performer from Wales for a chat about being a Jersey Boy, growing up watching your famous cousin on stage and thoughts of what the future might hold. Tell me a bit about how you got into performing. I’ve got a cousin, Michael Sheen, who is a big Hollywood actor now. I watched him and my other cousin Caroline (Sheen) on stage as a kid. That’s what started it really. I’ve always been into acting. Then when I was 16/17 I started classical singing lessons and I think that just worked for me and that’s it really. I went to Gorseinon College and then went to London to Arts Ed to do a degree in musical theatre. And here I am! What’s the first professional show you did? I was just listening to the cast recording of it on the way here: Fiddler on the roof, which was amazing. You can hear me singing on the album – my classical voice. I left college early to do that. I was working with Henry Goodman. It was unbelievable. He’s a great teacher and an amazing guy to work with. That was brilliant, I loved it. Then I went on tour with Flashdance where I met Kerry, my wife. And now I’m here. You have been in Jersey Boys for a while now. It’s my third year in Jersey Boys. It has gone so fast, it’s insane. We’ll see what happens next year but I think this could be my last year. But I’ve had such a good time in the show so far. And all that being a swing which I never thought I’d be. I couldn’t swing in anything else. I’m not an amazing dancer. But (in Jersey Boys) you’re not covering ensemble tracks. I’m covering five parts including the lead part of Frankie Valli. This is quite unique, isn’t it? Usually swings mainly cover the ensemble parts but in Jersey Boys you do get to cover the leads as well. Yes, exactly. I’m enjoying that. It keeps you busy. When you start out in a show as a swing, how exactly do you learn your parts during rehearsals? You have to literally make yourself a bible. You’ve got the whole script and score and each part is highlighted in a different colour. I found my first notes the other day, I used to do notes for myself when I started. Nightmare! I couldn’t understand a word. It was just scribbles, “Going of here”, “Going on here”. Hilarious! Did / do you watch the show a lot? Yes, we have to make sure we’re watching once or twice a week just to keep it fresh in our heads. But when you know what you’re doing it becomes an easy job which is one reason I’ve stayed for a few years. And they pay so well, too, so I’ve paid off my debts at last. Plus it’s a lovely company to work with. It will be sad to leave. But then you’ve only just started your third year so it’s still a while to go. Yes, exactly. It’s another year. I’ve seen two cast changes and it just gives the show a nice lift. It’s sad to see people leave, like Paul (Iveson). I miss Paul. It’s always been a lovely cast. Brilliant people. What’s your favourite part to play? It’s got to be Frankie Valli! But I do love to play Barry as well. Actually I love them all. So there’s no least favourite part? You know what, there isn’t one. I love doing all my parts. I thought it might be Hank because he’s got the least to do compared to your other parts. Yeah, but then sometimes when they say I’m on for Hank I’m like “That’s nice and easy”. I’ve done Hank so many times I could literally just go on and play him on autopilot. I try not to, of course! It’s one of the smaller parts but it’s fun. And everyone gets their own little highlights in the show, comedy bits and so on. What about Bob Gaudio? Would you like to play him again? I’d love to! But I’m the third cover so chances are I won’t get on again. I went on for Bob for a week about 2 years ago which was great. I listened to a recording the other day and, I don’t know, I think I’ve changed a lot since then (vocally). So what do you do during the show when you’re not on? I’m sitting backstage going through scenes, learning my lines…. (laughs)…. Ok, most of the time I watch TV or play Playstation. But only when I know what I’m doing. Take the new guys that have just started out in the show: They’re watching the show constantly. But give them two weeks and I’ll get them on the Playstation! The new guys are lovely – Ben and Edd. A few people have been with the show since the beginning. There’s Mark Isherwood, Lucinda (Gill), Ben Wheeler, Stuart Milligan, Tee Jaye (with a year away in between) and Ryan Molloy who have been there from the start. This is such a good show to be in. It really will be sad to leave. If they offered me something like first cover Frankie I’d stay. But I don’t think they will. They want the first cover to be Joe Pesci. Last year they changed that and had Tom (Oakley) as first cover but I don’t think they think it worked. And because I know five parts in the show I think I’m a bit too valuable to just have me as Joe Pesci, first cover Frankie when I know all the other parts. So I think that’s the reason why they won’t do it. As a swing you are basically on standby during the show. Did you ever have to go on mid show? 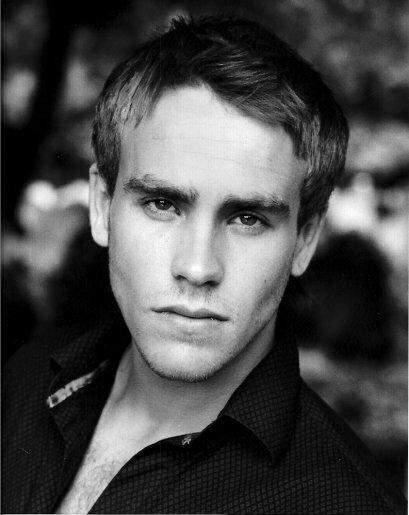 During my first contract Stephen Ashfield went off as Bob (Gaudio) so James Winter had to go on for him quickly. I got called down in Tommy’s house scene. So I had to come down, get my outfit on and carry on with the show. Luckily I didn’t have to go on during the second half yet. We (the swings) are up in the dressing room and we can hear everything that’s happening on stage. And sometimes we might get called down to go on. Does all this sitting and waiting ever get boring? It can be if there’s nothing on tv. I’m joking, of course!! No, it doesn’t to be honest. There’s always such good banter going on in the dressing room with Mark, Edd, Ben and Lucinda. We’re all having such a good laugh. Jersey Boys is a worldwide hit musical. Would you like to see any of the different productions of the show? I would like to see it around the world. Mark and Lucinda saw it on Broadway. And the audience just gets it over there, all the Joe Pesci stuff and everything. I would love to see another company do the show. It’s in my blood now. I know the show inside out but I’ve just seen it the way we do it. Mark said it’s like a completely different show (on Broadway). All the choreography, the score and such is the same but it’s just tiny little bits that are different. I’d love to see it somewhere else. As a swing you usually don’t know when and how often you will be on for different parts. But do you have fixed shows in your contract for certain parts, like Frankie for example? Not anymore for Frankie. When I was a third cover last year I asked for two shows. So then for this year I asked for another two but they said they can’t start doing that because obviously everyone else would start asking as well. So they got me up to second cover Frankie instead which is brilliant. Dan’s on all this week but fingers crossed I’ll be on for Frankie soon. I saw Dan play Frankie last night and I have to say he is fantastic. Yes! He’s really warmed into it quickly. It’s good for the company to have a reliable first cover. And he’s a nice and funny guy, good banter. You’ve been in a few shows so far. But what is your dream role? Before I did this show it was Frankie Valli. I’d love to do Chris in Miss Saigon. And it’s coming back next year! So maybe if I can grow a few inches I might be able to be seen for it (laughs). Miss Saigon is more my style of singing anyway. But then I’d love to have a go as Marius or Enjolras in Les Miserables… with Caroline (Sheen). I’d generally love to work with Caroline. What was the first musical you watched? It was Starlight Express which is the show Kerry is doing now. It’s funny how most people’s first musical was either Starlight Express or Cats. Mine was Cats. I fell asleep in Cats! I was up in the gods and my head just couldn’t take it. But yes, Starlight Express was my first show and I loved it. But then that was when I was about 14 years old and I wasn’t really into singing then so I didn’t think that was what I would end up doing. I thought it was going to be plays or tv. When I was 15 years old I got a part in a Welsh tv series and that was a great experience. So I always thought I was going to be an actor. So you’ve always wanted to be an actor even when you were a kid? Well, when I was a kid I wanted to be a fireman or a lawyer. But afterwards I was always torn between rugby, football, karate and drama. When you get to GCSE you have to choose what you want to focus on. And I think I chose the right thing. I hope so at least. I saw my cousin Michael Sheen play Caligula at the Donmar, Henry V and Jimmy in Look back in anger. And I saw him as Amadeus (in Mozart at the Old Vic in 1998/1999). I loved it. I didn’t really understand what was going on at that time. But I loved seeing him do so well. Imagine there was going to be a movie about you. Who should play you? And it can’t be yourself because that would be way too easy. Who would play me? I’m not sure there’s anyone that is weird enough to play me. It could be James Corden maybe. He’s so funny. If he loses a few pounds, he can play me. He’s fiery and bubbly so that fits. Fiery and bubbly is what describes you? I think so. And a little bit simple as in I am very easily pleased and amused. I’m all about making life easy and enjoying it. You go through some bad times in your life and you should just say “Get over it”. You try not to worry about everything and just try and get over it as quickly as you can and you’ll be alright. That’s my motto. One last question before I’ll let you go and warm up for the show tonight. What’s the most expensive thing you’ve ever bought apart from a home or a car? It’s got to be my wife’s engagement ring. Or her camera in fact! I couldn’t believe paying that much for a camera. Actually I think the ring was a bit more expensive. And my piano was expensive as well. Wait, now I’ve got it: My Apple iMac! Definitely worth the money though. It’s amazing. My toy! Thank you Michael for taking the time to answer all those questions! For more info on Jersey Boys and to book tickets visit http://www.jerseyboyslondon.com. Follow Michael on Twitter @mikconway . From what I’ve heard they are planning a revival of Miss Saigon, yes. It hasn’t been officially confirmed though.